So, gals, who all have gone for straightening or rebonding sessions or are planning to do. I know you all have to worry about special care for your hair all the time to lessen the hair damage and to have the long lasting effects of your costly chemical rebonding. Right na !! Matrix Opti Care Smoothing Shampoo is a professional haircare line especially formulated to care for chemically straightened hair. The shampoo helps to keep the hair smooth and straight. The opti care shampoo has a blend of ingredients like Shea butter, Silk amino acids and Apricot kernel oil to help condition hair, repair damage and Smooth frizz for healthy, sleek hair with hi-gloss shine. The pleasant smell lives a lingering freshness. Rs. 465/- for 400 ml. Matrix is one of my favourite brand for hair care and since I have curly hair, I have dry, damaged hair and split ends too. Matrix shampoos have helped me a lot in improving my hair texture and quality a lot and since past 4 years, I am using Matrix range on and off for my hair care routine. I love Loreal Absolute Repair too and will review that soon. This shampoo is white in colour and is creamy in texture. It is a little bit runny and not too thick. It lathers well and leaves the hair cleansed properly without giving the feeling of any buildups. 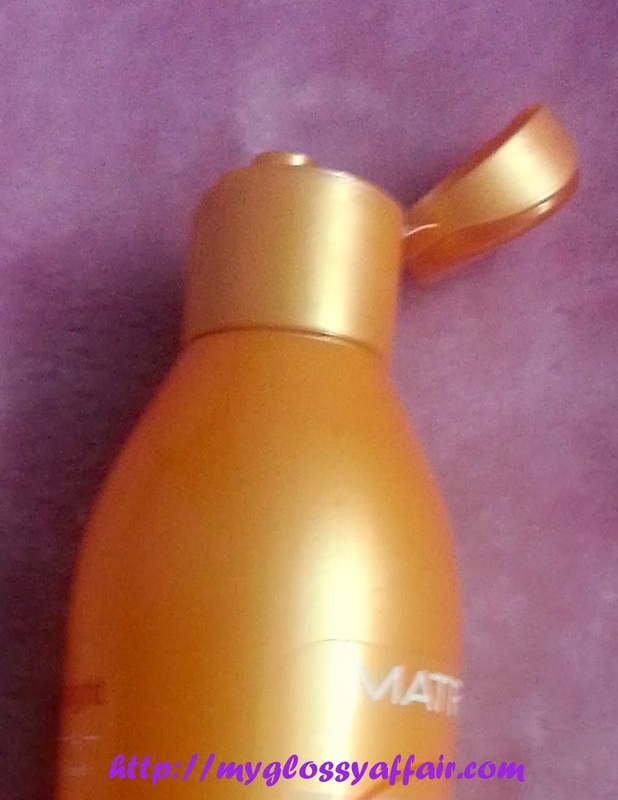 Matrix Opti Care shampoo come in an orange plastic bottle with a sturdy flip open cap. The bottle is travel friendly and doesn’t spill, no leakage. Those who have got chemical treatments done on hair like straightening or rebonding. Those who have damaged hair. Those who want straighter and smoother hair. Nice fruity, not over powering fragrance. Reduces frizz to some extent. 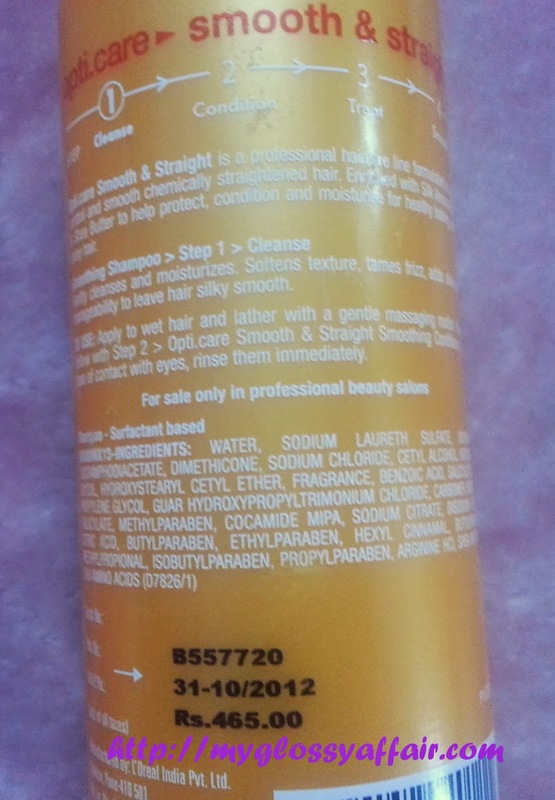 Makes hair a little smooth and straight as compared to other normal shampoos. Good for dry, damaged hair. Justified cost, given the quality and it is a salon product. It contains loads of chemicals. I would say you can give it a try if you have got your hair chemically treated. It helps in making them smooth and straight and reduces frizz to some extent. Also, those, who have damaged hair or split ends like me can also give this a try. It will not reduce split ends but improves the texture of hair over time and split ends look less obvious. I've never seen this product before, but it look nice. I’d love for us to keep in touch via bloglovin’, GFC, or Instagram! Let me know on my blog, I’ll be sure to follow back! oh this sounds great for chemically treated hair. Nicely reviewed hun.! Interesting post. You have a new follower here. Hope you could follow me back too. Thank you. A very detailed review! great! Sounds like a great product hun. I always enjoy your reviews. Nice review, this shampoo sounds great, I'd like to try it! The only thing that stops me os using it, its the parabens. Thanks so much for the info. have used this before when I had smoothened my hair some time back..was good then! Hi Charu, thanks for your visit on my blog. Yes I would like us to follow each other. I have already started to follow you on GFC and Facebook, so here's my blog and my Facebook page, hope to see you soon. have heard great things about this brand! Great review! I need a shampoo for dry hair as well. It sounds great Charu!! Will check it out! Great review! Thanks for sharing. Would you like to follow each other on gfc and bloglovin? Just let me know on my blog! I have seen these products at store and never tried them. Thanks for the good review. It is interesting. i really like what you say on your blog! maybe wanna follow each other? My hair is also damaged. I keep trying new hair care products although I already know what I like the best. I am too curious! Looks good although I am not sure about the chemicals. Great review! I don't think I would buy it because of all the products in it, but I am glad to know about it now! Hmm this might be a thumbs down for many!! Owww thats really scary Arzoo!! I think you might be allergic to some of the ingredient in it!! Thanks a lot Darcy, I know the ingredients might be a turn off! !